Art flows through people in many different ways. On the North Coast there are carvers, Chilkat weavers, painters and there is one particular woman who has the art of grant writing. Joanne Finlay has volunteered in the community for the past 30 years and has become a successful grant writer for First Nations artists, the Lester Centre of the Arts and other artist projects in the city. From 1998 to present day she has raised $674,000 in grants for artists and art projects in the community. “I can’t imagine being an artist. I can’t draw a straight line with a ruler but I appreciate the arts because I understand after this many years how much work it takes to actually be an artist,” Finlay said in her home adorned with Aboriginal artwork. Even her teacups are decorated with designs from local artists. Her family is from Lax Kw’alaams and she is Gitwilgoots, which means the people of the seaweed. She said there is art everywhere, even in wooden spoons. “They were decorated because they were so rich and so well looked after from our land that we had time to actually develop art,” she said. Born in Prince Rupert and raised by her mother, grandmother and great-grandmother who had all gone to residential schools, Finlay grew up in a different era — the Sixties Scoop. At eight years of age, Finlay said someone from the Mormon church came and scooped her up along with other First Nations children from Haida Gwaii to Smithers. They were put on a train and placed into a white foster home in Alberta. For five years she lived with a white foster family and would only return to her own family in Prince Rupert in the summers. She missed out on her culture, the language, her identity. Her mother taught her to be a leader and told her to volunteer and attend community meetings. “That was the way my mother raised me. ‘Well, go out and help your people, don’t just sit around’,” she said. When she went to the University of British Columbia and studied First Nations community planning she discovered her own gift — the art of the written word. Grant writing came later when her younger brother became part of the revival art of Chilkat weaving. Finlay said her younger brother, Willy White, was heading down the wrong path in his early twenties. Their mother took him to seaweed camp to harvest for a week and a month later they returned and he was a changed man. He learned to weave cedar bark and progressed from basket weaving to Raven’s Tail weaving. White has a black and white robe on display at the Museum of Northern B.C. “Chilkat is the only art in the world that can weave a perfect circle going side to side. I don’t know how they do it. It takes years,” Finlay said. Her brother needed money for the materials for weaving, and so she started applying for grants for him, and then for other artists. 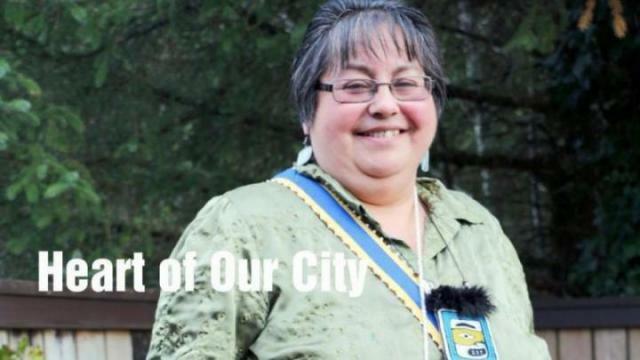 She organizes with the First People’s Cultural Council as an Aboriginal Arts Administrator. She has also been on the board for the Lester Centre twice, and currently she’s the vice-president for the Prince Rupert Performing Arts Society. She’s helped the arts centre get a new rehearsal hall, stage lights, and with a $150,000 community investment fund from the Port of Prince Rupert they were able to renovate the lobby, the rugs and have the green room painted. One of the main reasons she said she’s on the board is to bring more Aboriginal content to the Lester Centre. The grant writer is also an Aboriginal family support worker at Roosevelt Elementary School and the Pacific Coast School. Her real dream though, is to purchase the building that Stiles Place Seafood and Grill is selling, and to turn it into a First Nations artist centre. The centre would be a space for the artists and for tourists to visit and be educated on Tsimshian art and materials used, such as cedar bark. She said she could never afford the site, but she keeps buying lottery tickets hoping, or maybe she may find the perfect grant to make that dream come true.